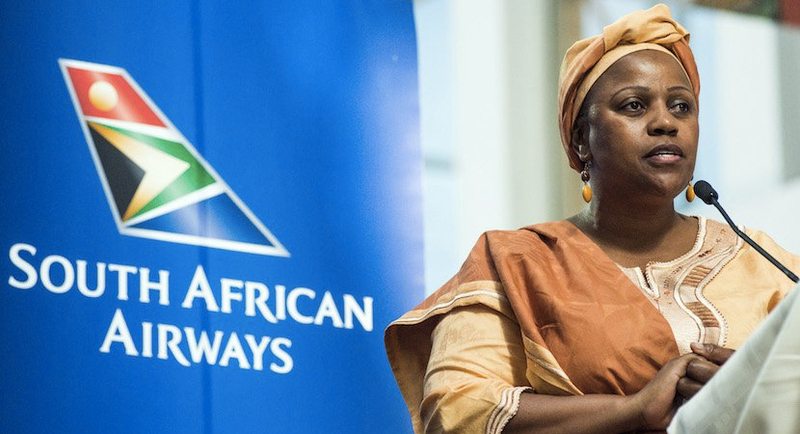 The Board of South African Airways has been handed a damning ruling following the internal disciplinary hearing of two executives who were suspended for their role in a controversial cash-raising deal. The transaction that saw the bill for BnP Capital, then an unregistered financial services company, balloon from R2.6 million to R260 million in a matter of weeks, was cancelled following a public outcry in 2016. In the ruling, handed to the new board last week, former acting chief executive Zwane and Nhantsi, the airline’s chief financial officer, were found guilty on charges relating to the aborted transaction that was to help SAA raise R15 billion in funding to ease its debt repayment woes. At the heart of the scandal was BnP Capital, a company installed as transaction adviser without due process, and the Free State Development Corporation which had been called in after the winning bidder failed a due diligence exercise. 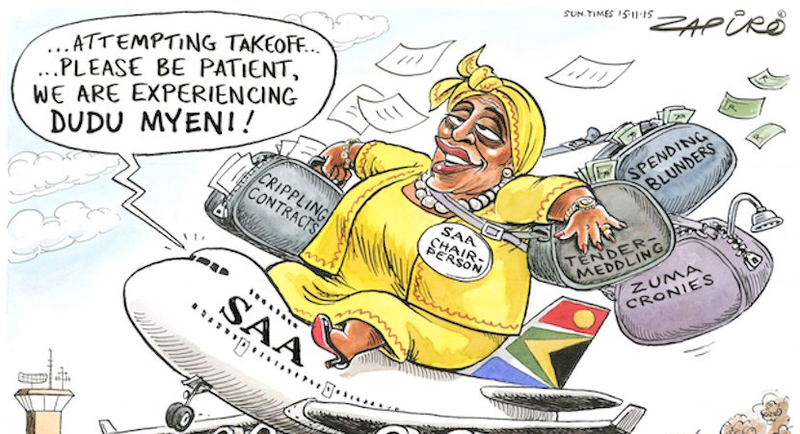 The deal was later blocked due to public pressure, including intervention by civic organisation, Outa – but not before SAA, allegedly under pressure from then chairwoman Dudu Myeni, attempted to release nearly R50 million to the company. Zwane and Nhantsi, who were suspended in March 2018, declined to comment. They confirmed that they had received the ruling but said that since they had not been sanctioned by SAA they were unable to comment on the outcome or their appeal options. The ruling, handed down by chairman of the hearing, senior advocate Nazeer Cassim, states that both knew the deal was fraught with irregularities, that they had failed to distance themselves from it and, in the end, both were rewarded with promotions. Zwane, in all probability because he had shown himself to be “pliable”, was moved into the position of acting chief executive (he later returned to SAA Technical) while Nhantsi secured a permanent position as the company’s chief financial officer during Myeni’s scandal-ridden tenure, the ruling states. Cassim found Zwane to have been “grossly negligent” for failing to realise that the deal was suspect. And, said Cassim, his conduct demonstrated an individual who could not be relied upon to be a CEO of a company, let alone SAA. Nhantsi, a chartered accountant, had been seconded to SAA from the private sector until her permanent appointment as CFO in 2017. Cassim found her guilty of being “wrongful and dishonest”, saying she “went along with the charade and, in doing so, failed to have regard for the best interest of her employer”. SAA has yet to act on the recommendation that the two be dismissed. The airline said it would not comment until the board had considered the matter. Zwane and Nhantsi faced three and four charges of misconduct respectively and were found guilty of all but one for failing to report the suspicious circumstances around the deal to the Hawks. The company had withheld from SAA vital information that the Financial Services Board had suspended its licence to operate as a financial services provider, a fact that will have rendered any contract with it illegal. “The quantum leap in BnP’s appointment as transaction adviser for a fee of R2.6 million to a staggering quarter of a billion rand a month or so later without compliance to any credible procurement process is bizarre in the circumstance and has the hallmarks of corrupt activity,” states the ruling. When BNP got an initial letter confirming its appointment as transaction adviser, the company’s chief executive, Daniel Mahlangu, wrote back and inserted a little jackpot clause: That BnP would be paid a 50% cancellation fee should SAA ditch them prematurely. Once SAA was forced to cancel the contract, Zwane and Nhantsi drafted a request for board approval for a cancellation fee, something which there was no legal or moral basis for. Yet, bizarrely, neither of them voted in favour of it when it came to crunch time – this they left up to Myeni, who was the sole board member to do so, the ruling states. Cassim did not find this to have been a mitigating factor in view of their leadership roles at the time. Zwane testified, under oath, that Myeni contacted him to ask why BnP could not be paid. He told her that his limit for payment was R50 million and that anything above that required board approval. On 2 June 2016, Nhantsi compiled the document seeking CEO and board approval – by this time the company’s appointment had already caused a public outcry. The two executives signed off on a request for R49.9 million, just short of the limit that will have required board approval but it is noteworthy that Zwane still presented it to the board. Cassim further questioned why Nhantsi had disregarded red flags raised by Cynthia Stimpel, then group treasurer, who had informed her that the R256 million fee due to be charged by BnP was exorbitant as preliminary investigations indicated that the banks would charge R85 million inclusive of VAT. In August 2015, the then five-member SAA Board resolved to issue a request for proposals for long-term funding to the tune of R15 billion to consolidate SAA’s debt portfolio. While seven bidders, including three major banks, submitted tenders, the deal went to an unknown entity called Seacrest Investments 115 Pty Ltd, a company with no discernible assets. However, the deal with Seacrest couldn’t continue because a due diligence exercise then found that it had no funding and was to rely on an unknown Russian outfit called Grissag to source the funds. Interestingly, the involvement of Grissag did not end once Seacrest was out of the picture. The ruling states that Myeni intervened and introduced the Free State Development Corporation to take the place of Seacrest. The FDC would now source the funds via the Russian company. Zwane and Nhantsi were tasked with negotiating and concluding a slightly reduced loan offer of R14 billion from the FDC with the Russian company remaining as the source of the funding. Yet, said Cassim: “Nhantsi’s only investigation was that there were two farmers in the Free State of Afrikaans descent who had the connection with Grissag. It never occurred to her to investigate this matter any further. “Her meeting with the farmers and her knowledge of the matter of the source of the funds was limited to one of the farmer’s names, being Van der Merwe. How can this be of assistance?” Cassim noted in his ruling. Cassim, in his ruling, raised what he billed a “critical conceptual prima facie finding” in respect of Myeni. While aware that Myeni was not given an opportunity to test claims against her, Cassim noted that sometimes systems and procedures undermined the pursuit of facts. Myeni, in response to detailed questions, labelled the claims against her as “slanderous” and tantamount to “character assassination”. She said she was no longer in charge of SAA and questioned whether other former SAA bigwigs would be subjected to similar tactics. Cassim’s ruling went beyond the charges against Zwane and Nhantsi and raises important points about the state of the national carrier and the conduct of those appointed to serve in the public interest. The airline, which reported a loss in excess of R1.2 billion, faces a bleak future in the short term.